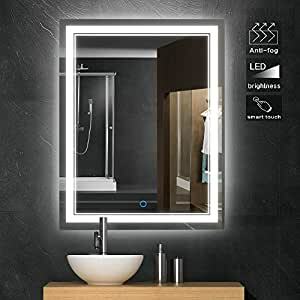 ANTI-FOG–Electronic defogging layer, makes silver lighted vanity mirror show much clearer in bathroom and powder room. – This product is wall mounted only. – A minimum of two people are needed to perform this installation. – We are keen to offer great customer service. All inquiries will be responded within 24 hours. We truly appreciate your business.Any question, please do not hesitate to contact us, we are ready and happy to help ! My item arrived broken. The mirror is what Iâm looking for. Will return and buy again.